On Monday, Really Simple Software officially announced the Simple.TV, a device that brings DVR and remote viewing capabilities to broadcast television. The successful Kickstarter project is now available for pre-order. The $149 box is aimed at cord cutters, who’ve abandoned expensive pay TV packages in favor of either basic cable or broadcast TV using an antenna. Simple.TV can stream these video signals to a Mac, Windows PC, smartphone, or tablet with an HTML 5-capable browser, or a Roku box (via a private Roku channel). When viewing on a computer or iOS device that supports AirPlay, you can also send the video to your TV though an Apple TV. A native iPad app is also in the works. It can also act as a DVR and record broadcast shows for later viewing. To put it another way, it’s like a cross between Slingbox and TiVo for broadcast television. 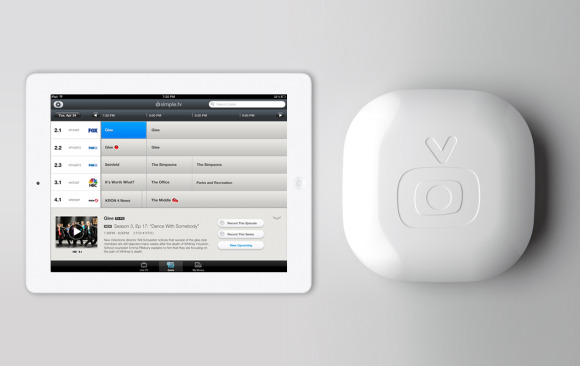 Simple.TV does have some hidden costs beyond its $149 price tag. If you’re relying on over-the-air broadcasts, you’ll need to plug in your own antenna. For DVR capabilities, you’ll have to connect an external USB hard drive to the device, because there’s no built-in storage. Also, some features require a Premier subscription, which costs $59 per year. This service includes remote streaming outside your home network, a detailed program guide for broadcast shows, and the ability to record entire TV series automatically. Users can purchase a Simple.TV box and a year of Premier service for $199, or get the box with lifetime service for $299. A couple other caveats: Simple.TV doesn’t plug into your television, so you’ll need a Roku box, another device with a Web browser (such as a home theater PC or Google TV), or the aforementioned Apple TV/AirPlay combo to access shows on the big screen. It also requires an ethernet connection to attach to your network, which could be a problem if your router isn’t located near a window for the TV antenna. Simple.TV is banking on the idea that many cord cutters already have most of the necessary components. If you’ve ditched cable, there’s a good chance you already have an antenna and some type of streaming set-top box, or you’re watching a lot of video on a laptop or tablet instead of a television. In that case, Simple.TV provides the time- and place-shifting without the huge cost of cable and its recurring equipment rental fees. And that idea—getting as much content for as little money as possible through clever workarounds—is what cutting the cord is all about. Simple.TV is taking pre-orders now and expects to ship products out in the next two to three weeks.